And while I know that all that still holds true, the biggest revelation in this first month of marriage has been just how much Light there has been. How good, how true, how settled it has felt for our two little lives to fall into step with one another. Something changed when we made those promises before God, each other, and those we love. As my mum reminded us in the sermon she gave at our wedding, there is something profound and important about hearing your voice make those promises out loud to the other, to hear the other make them back. Something outside of our own understanding shifts in those moments, I believe. When we tell our truth, when we lift the veil, when we look one another in the eye and say ‘This is my promise to you’. I love that in the Church of England tradition, the reason we respond ‘I will’ to those promises is because ‘will’ is an ongoing promise. One which we will have to remember and choose to keep every single day. And I truly felt a simultaneous overwhelming and settling as we said those words, as time slowed down, as we locked eyes and hands, as we repeated those promises in words and deeds over the course of the days that followed. Through the exchange of those words, it felt as though so much of that which had been suspended in tension in the lead-up to the wedding could fall where it naturally belonged – things falling away and things taking root. There was a grace which wrapped up the sacrament of our promises offered to God on our wedding day which has come to dwell as a light within us ever since. A light so dazzling and unexpected in its abundance – a profound and wonderful mystery indeed. The everyday beauty of our love for each other, the joyful privilege of seeing our families come together – each making space for the other to form a circle wider and more diverse and resplendent with the glory of God; listening to and laughing with one another. The amazing friendships and communities with which we have been blessed who have come alongside to love, encourage and celebrate with us in countless ways. The kindness of a restaurant owner in Reykjavik who opened up especially on a national holiday to cook us a honeymoon meal. 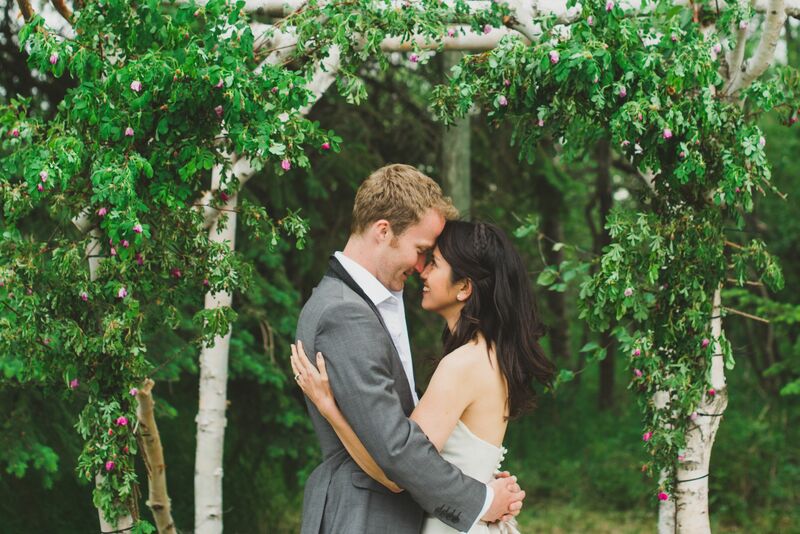 The chance to have not one but two wedding celebrations in London and in Canada, soaking in the best of both worlds and cultures. Watching my family and friends’ eyes widen and hearts fill with the same awe as has captured mine as we drove into the Rockies to spend a precious night under the stars. The fact that a perfect hideaway was free in the Canadian Rockies for the three days which we needed for a retreat just the two of us. The chance to spend hours on those wide open Canadian roads just he and I – roads etched deeply with memories of our story. Our love story criss-crosses the roads of this land, each journey laced with memories of stories told, wildernesses discovered, hands held, healing wrought and laughter shared. We are equal partners, I believe, because we have logged the hours spent side by side; those hours form the foundation for the painstaking and life-giving practice of saying ‘you first’ – something which I remain woefully bad at, but long to learn to do well. And yet all this time there was a niggling at the back of my mind. A voice whispering words of guilt in my ear… Words like: I am so consumed with love for and excitement for a new life with my husband, have I invited God into it at all? I have spent barely any time alone with God. If I love my husband this much, is there less left over for God? S/he must be so disappointed in me. I have been blessed beyond all imagining and am like the healed who forgets to go and say thank you. Maybe we should fast for a week! These words were so subtle I barely recognised they were there until they had been swirling around unnoticed for quite some time. But they came to the surface one evening as I questioned to my husband whether we should maybe be a bit less wide-eyed and just get a bit more real. Surely this overflowing and don’t-want-to-be-apart-from-you love isn’t glorifying to God, is just a bit teenage and ridiculous? And he looked at me, half smiling, half despairing and said: ‘I think you’re too hard on yourself. This season? I think it’s good’. I remembered the words of a haiku quoted by my mum at the start of her wedding sermon – words which reminded us that no matter our circumstance, we are children of a God who invites our spirits to dance in Love-Light. Do I think it’s right to question and to grapple and to dig deep into the soil of our lives – the messy and the hard – to know in our real scars and tears the truth about a God who brings dancing from mourning, joy from despair and life from death? Absolutely. I believe that before the resurrection comes the cross and that we miss the point if we don’t hear the voices which cry out with pain and suffering and all that is yet to be made right – in ourselves and in our neighbours and in creation. But isn’t it also true that, before we do any of the digging and the searching and the doing and the partnering – we are beloved? See, the winter is past, the rains are over and gone… the season of singing has come. Perhaps this season of dancing in the Love-Light and of singing – perhaps this is something God wants so very much for us. Perhaps our laughter bubbling out of cuddles and kisses and low murmurs in the evening and shared jokes and secret, soft places is just what our God longs that we drink deeply in this season – or even for always. Perhaps the love we are experiencing – so powerful it makes us blind for a time to those well worn altars of striving, doing-the-right-thing, discipline, box-ticking, doing and being things worth writing about and telling friends about – is just what God is delighted that we are experiencing. Our God is for us. Our God wants good things for us. As the prophet Isaiah writes, our God ‘longs to be gracious to us’**. Perhaps our God is a mother, a father sweeping us into a dance of freedom out in the wild, long grasses – a dance which causes us to twirl around until the old world can’t even be seen clearly anymore – and instead as we dance, we see catching in our hair the Light which we know – oh, we know – is leading us home. This entry was tagged #joy, beloved, dancing, grace, journeys, love, marriage. Bookmark the permalink.